The American Southwest is hands-down one of the best road trips in the world. How did it take me 31 years to finally take a camper van out and explore this magnificent area that has always been in my own backyard? 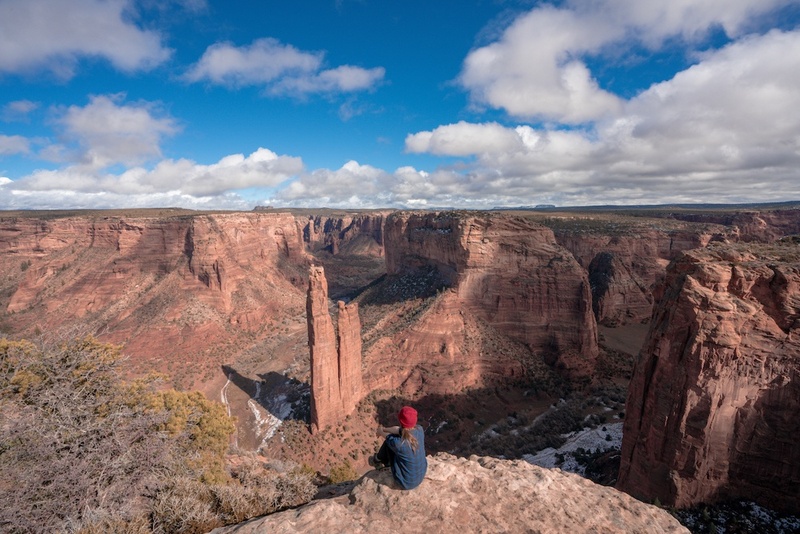 I used to think that the best things to see were international until I did the American Southwest and realized what incredible canyons and wide open spaces I’d been missing all this time that were never all that far. Though I only had about a week to get a taste of this area, I think one could easily do a month just in Southern Utah and still be rushing around. 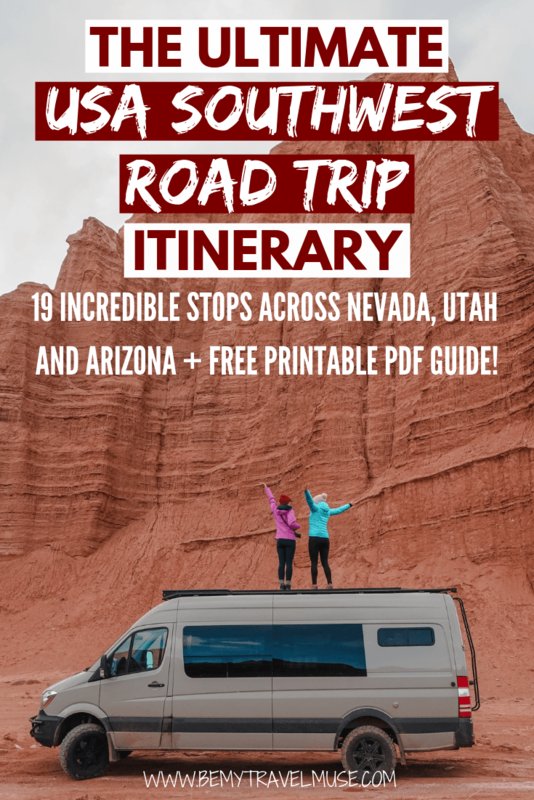 With that in mind, this road trip itinerary is based on the famed Grand Circle trip with a few variations on the theme thrown in. Some of it will take you through well-loved and sometimes crowded national parks and some of it will be in desolate landscapes where you might not see another person all day. Some of these recommendations are off the beaten path and others are quite popular but with a well-deserved reputation. Gear up, because this is one of the finest adventures in the wild west! This itinerary begins in Los Angeles, California. If you’re doing a similar trip, you might want to start there for ease of getting in and out, plus tons of rental options. I went with a camper van from JUCY (you can compare options incl. Jucy here) which had a sink with a water tank, a super comfortable bed, a full kitchen, and a solar panel to keep me charged when I was otherwise off the grid. It was such a convenient way to do this since I never had to set up a tent, could just drive off and leave easily without leaving a trace, and could keep all of my food refrigerated and cook and eat anywhere and everywhere. I also encountered some rain on my trip and rain in a camper van is a non-issue but in a tent it can be most uncomfortable. Also keep in mind, much of the land in Utah, Arizona, and even parts of California is BLM (Bureau of Land Management) land which means it’s public and free to camp as long as you’re not visible from the road and you leave no trace. That’s what makes a camper van such a good deal and one of the best ways to see the American Southwest! You’ll see me reference this throughout the article. Nevada is typically synonymous with the booming nightclubs, dazzling lights, and poker tables of Sin City. While I’m a big fan of the strip for a girl’s trip, I also know that there’s much more to Nevada than just Las Vegas. The surroundings can be beautiful as well, and if on a trip where your aim is to appreciate the natural beauty, you’re still in luck in gorgeous Nevada. 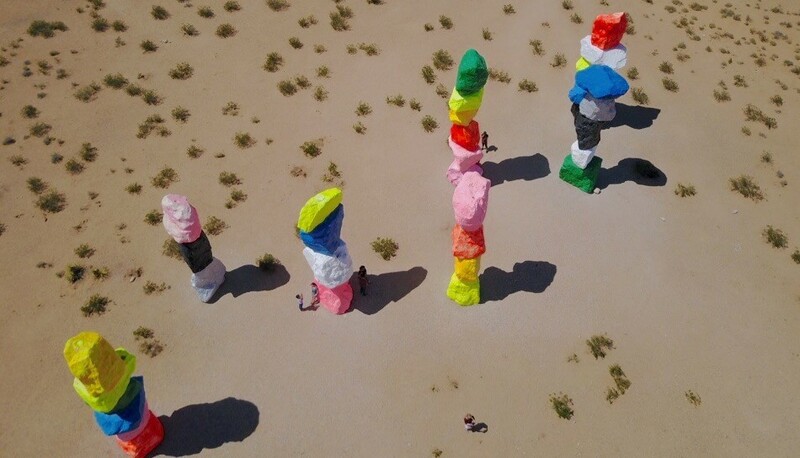 Seven Magic Mountains is an art installation by Swiss artist Ugo Rondinone off of Highway 15 just before Vegas if coming from Los Angeles. It’s a series of, you guessed it, seven stacks of brightly painted rocks meant to symbolize the midway between the natural and the artificial which are the mountains and the highway. It’s meant to stay only through the end of 2021, so stop by while you can! It’s only a slight detour off of the 15 and it probably only cost me 20 minutes total to pull off and see them. If driving on the 15 from Los Angeles you’ll see the sign for the turnoff about 15 miles before reaching Las Vegas and can navigate there using Google maps as well. Not a bad way to finish day one! Since I only had about a week to get through my whole itinerary, I figured the best way to finally see the famed Grand Canyon would be to skip the crazy long drive and crowds and to fly right into it at sunset. Fast, easy, and in style! After the Magic Mountains I got a quick bite to eat and headed to Maverick Helicopters for their Wind Dancer sunset tour which departs from the strip during golden hour, lands in the Grand Canyon for champagne, and flies back to the strip at sunset, just as everything on the strip is lighting up. I had always expected that the Grand Canyon would be quite grand (and it was) but what really surprised and impressed me was how beautiful the scenery we flew over to get there was. It’s an incredible way to get a glimpse of some remote and desolate areas that you wouldn’t otherwise see, plus it packs a lot of great experiences into just a few hours. It’s one of those splurge experiences that’s oh so worth it. Good morning, Valley of Fire! Valley of Fire is a state park in Nevada and my first overnight of the trip. After the helicopter ride, I continued the additional hour to the first come, first serve campgrounds within the park boundary and settled in for the night, awakening for sunrise the next morning. The park entrance is regulated with an honesty box to collect the $10 park fees and $20+ camping fees if you arrive after dark like I did. It was also totally empty around sunrise, so it felt like I had the park more or less to myself in the early morning hours. That was pretty cool! Recommended sights: Seven Sisters, Elephant Rock, Beehives, and Fire Wave Trail (if you have more time). Camp: Check space at campsites within state park or alternatively camp on BLM land just outside of the east park entrance. Southern Utah has to be one of the most incredible areas in the American Southwest with its endless canyons, bright orange rock, and unique formations carved by water. Some of it is just inexplicable with its colors and shapes and looks like nothing else on planet Earth. In Utah, you’ll see an overwhelming amount of options for camping, hiking, biking, canyoning, kayaking, etc. Unless you can spend months here, you’ll have to make some heart-breaking decisions between which parks to see and which to skip. Some, like Zion and Bryce are mega famous and will be packed with people, and others, like Grand Staircase-Escalante, you just might get all to yourself. Zion is one of the most popular national parks in the United States and a pretty impressive must-do on your southwestern road trip. It’s a large park with a popular main canyon which features Angels Landing, The Narrow, and Observation Point, plus a bunch of short and easy hikes if you’re low on time. The main park is accessed by park shuttles that start running around sunrise and end around sunset. They change depending on time of year so check here before making plans. I stayed near Zion for two nights and hiked the Watchman Trail, Observation Point, and Upper Emerald Falls and enjoyed all of them. Sadly, The Narrows was closed due to too much water, but that is one of Zion’s most popular hikes and I was sad to miss it. I had visited Zion 10 years prior and did the Angels Landing Hike. Even back then, with far fewer visitors, it was a pretty hectic trail with the narrow drop-offs and hand chains, though it was incredibly beautiful. This time, I did Observation Point instead which is an 8-mile trail that actually looks down on Angels Landing. More on that here. Camp: Campgrounds book out months in advance around Zion, and first come, first serve spots are usually snatched up too. There is BLM camping in the eastern part, or you can camp at the Zion Canyon Campground and RV Resort owned by Ferber Resorts which is walking distance to the park, has some riverside spots, and costs $44/night (plus tax) with showers, Wi-Fi, and toilets. Bryce is known for its famous hoodoos, the natural amphitheater, and the sunrise and sunset viewpoints. It’s also quite a bit higher in elevation than Zion, so bundle up! This is a park that I had visited 10 years prior and decided to bypass this time (the image above is the only one on this post that is not by me, and sourced from Creative Commons) so that I could get to Grand Staircase earlier. It’s not because Bryce isn’t impressive, it’s because I wanted to spend a bit more time in Zion and other parks this time. That said, you could just do one hike in Zion and head out to Bryce in the afternoon, and spend a day in Bryce as well if you want to see both parks. It would be totally doable! Recommended sights: Sunrise Point, Sunset Point, Queen’s Garden, Bryce Amphitheater. Camp: There are several first come, first serve campgrounds in Bryce which you can get information on when entering the park. Click here to find it on the map. From Zion, take the road through the tunnel and out of the park onto scenic Highway 12 for one of the best drives of your life, seriously! Leave some time to stop at the scenic overlooks and parks like Bryce and Grand Staircase-Escalante National Monument because they are more than worth stopping off at. I spent about 4 days hiking and camping around this area, and it’s one of my favorites of the whole trip. I can’t say enough good things about the Grand Staircase-Escalante. It’s an area of over 1 million acres of protected land that has so many adventures inside of it that it would take a lifetime to scratch the surface. The biggest differences between this area and the national parks is most of the trails in the Grand Staircase-Escalante will be accessed via dirt roads, some of which will be 4×4 only. There will rarely be services, like running water, paved trails, bathrooms, and electric hookups. The benefit is almost no crowds, free camping in the wilderness, and natural areas that are no less impressive. I did the Coyote Gulch trail in one day via the sneaker route, which does involve using a rope to climb down a 250-foot vertical rock and navigating by GPS, but it was also one of the best camping and hiking experiences of my life. More on that here. Recommended sights: Zebra Slot Canyon, Peek-a-boo Canyon, Spooky Slot Canyon, Coyote Gulch, Devil’s Garden. Camp: Find BLM camping off of dirt road offshoots and drive for long enough that you’re not visible from the road. This is what I always did in Grand Staircase-Escalante as it’s free and legal. After Coyote Gulch, Capitol Reef is a fantastic stop.There’s a scenic drive that’s pretty popular, but to see a part of it that gets way less foot traffic, I highly suggest going out to the Temples of the Sun and the Moon. If you have a 4×4 high clearance vehicle then the Caineville Wash Road should be no problem for you as long as it hasn’t rained a ton recently. If in a sedan, ask at the National Park office to see what the road conditions are. Recommended sights: Temples of the Sun and the Moon, Queen Bee rock formation, Upper Cathedral Valley Overlook. Camp: There’s first come, first serve camping at Cathedral Valley Campground which, at least when I visited, was free. This will be a detour off of Highway 24 though it needn’t be a super long one. Once you enter the state park ($15 fee) you’ll see it’s not particularly large, though giving yourself time to walk among the goblins from the overlook would be wise. There’s also camping available in the state park and it’s worth noting they have pretty nice bathrooms! Just outside of Moab, Utah, Dead Horse was one of the most impressive views I saw on this trip and I can’t believe it’s not more popular. The cost to get in is $15 and it’s a pretty small park, but the views at sunset are incredible! While the main viewpoint at Dead Horse Point will have a few people around in the summer months, in the winter as pictured above, you could get it all to yourself. The majority of the view was totally open and there are plenty of spots where one could enjoy it in privacy. In the photo above, I’m perched on a rock above the cliffs over the viewpoint. Wowzers! Recommended sights: Dead Horse Point and if you have time, walk to it from the Visitor Center. Camp: Find BLM camping off of dirt road offshoots and make sure you’re not visible from the road. You’ll have to find a spot outside of the state park. Since I was already in the area, I decided to camp on BLM land between Dead Horse and Canyonlands National Park. You will see some ‘no camping’ signs, but most of them will say ‘no camping for the next 1/3 mile.’ After that, you’re free to camp. Just watch out for potholes in the dirt tracks. Mesa Arch is easily the most famous feature of Canyonlands National Park, particularly at sunrise. As you can see, everyone wants to get a shot of that sun lighting up the arch and the sweeping view of the canyon below. I would recommend getting there about an hour or more before the sunrise if you want an optimal spot for photos. This one was taken from the right side of the arch. After my Mesa Arch sunrise, I drove to Arches National Park to check out some arches quickly before continuing on. This park is incredibly popular. It’s also home to the Delicate Arch which you see on the Utah state license plate. The photo above is of The Windows, which is an easy offshoot within the park where you can see a bunch of arches at once. At the time of this writing, the park was closed at night for road construction which made me spend more time in Canyonlands, a decision I ended up being quite happy with! Recommended sights: The Windows, Delicate Arch, Fiery Furnace (must register for this the day prior at the visitor center), Devil’s Garden. You can read more about the best hikes in Arches here. Camp: Find BLM camping off of the 313 towards Canyonlands. Since you’ll be passing by, the Needles Overlook on the way to Valley of the Gods is vast and gorgeous. It’s an easy, drive-up viewpoint that will take about an hour to two roundtrip. I would only do this if you have the time to and wouldn’t have to cut something else that’s important to you. However if you have a few more days than I did and can take it easier, stop by here (this was taken on a later trip). Not a bad camping spot! The Valley of the Gods was an impromptu stop for me when I saw it off the side of the highway and decided to take a little detour. I’m glad that I did, because this sparsely-visited valley had such neat rock formations, in layers of color and looking like they were reaching up towards the sky. I noticed plenty of BLM campers here and liked it even more than the subsequent drive through Monument Valley, which came right after in Arizona. Take the Valley of the Gods road offshoot and connect with the 261 to come back to the 163. Can’t visit the American Southwest and not see Antelope Canyon! Next you’ll make your way to Arizona which is famous for some more incredible canyons, like the Grand Canyon, Horseshoe Bend, Antelope Canyon, and The Wave. This national monument is a reasonably big detour if you’re short on time. However if you can spare an extra afternoon, I’d suggest taking a look because you won’t see as many people as you will in the other spots on this list, and it has some ancient cave drawings you can take a short hike to as well as several beautiful overlooks like this one, Spider Rock. This probably sounds silly, but I hadn’t realized that as I made the 8-hour drive from Moab, Utah through the Valley of the Gods and onwards to Horseshoe Bend, that I would be camping next to Lake Powell! It was a pleasant surprise since it’s such a lovely lake and the perfect jumping off point for some of the most famous things to see in Arizona. Camp: There’s a BLM spot outside of Paige. Just be careful not to go into the deep sand, as I saw two cars get towed out of there! I wondered if Horseshoe Bend truly could look as amazing in person as it does in photos, but it does, it really does! It’s also a super easy and quick walk from the parking lot. I did it in flip flops. Be sure to get there about an hour early if you want to stake out a good spot for the sunset. There are plenty of boulders on the cliff edge that you can perch on until the sun sets, and I can’t think of many better places to hang out, either! Chances are good you’ve seen those trippy photos of the Upper and Lower Antelope Canyon on social media and are dying to see them yourself. Like Horseshoe Bend, the Antelope Canyon truly is gorgeous to see in person. Those swirling red rocks are so unique. They are also popular. I still can’t decide if I loved or loathed the experience because it’s so crowded in there! You’ll have a hard time if you’re claustrophobic, which I am, but only mildly. I did both the upper and lower and both are worth seeing (I have a comparison written here), as the lower tends to have more colors and the upper has those famous light beams, but only at certain times of day. Gear up and prepare for the crowds, do your breathing exercises, and don’t forget to look up. The next most famous stop in Arizona is usually The Wave, famous for the wave-like shape and color of the rock. Only about 20 people get permits to see The Wave each day, and you’ll need to apply at 9am the day before in Kanab, Utah. Since I was in Paige, I opted to see White Pocket instead which almost nobody else was visiting. I thought it was incredibly impressive! If you can’t get into The Wave, make this your alternative. I suggest booking with Kanab Western Adventures to experience this hike which is accessed via one very sandy 4×4 road. More on the experience here. Over one week, over two thousand miles, lots of sunrises and sunsets, nights full of stars, and sore legs, this was my American Southwest itinerary. It’s one of the greatest adventures I’ve had, and I’m sure it will be for you, too. With some experiences you can get to yourself, and some you’ll have to share, this is the perfect mix of solitude while still experiencing the popular must-sees. What Does an American Southwest Road Trip Cost? *Some of the companies mentioned here are partners who helped make this article possible, and some links are affiliate links. Anything you purchase through these links helps keep this site running at no extra cost to you! Observation Point vs. Angel’s Landing in Zion, Which is Better? This sounds like an awesome trip, I would love to do a trip like this sometime! Aside from having to book a couple places ahead that are really popular, like Zion, it seems like it would be possible to wing the whole thing too. I hate structuring hiking based trips, I like being able to hike random places on a whim. What season did you do this in? Obviously a winter trip wouldn’t be recommended unless you know how to drive in the snow, but I wouldn’t care for summer because of crowds and heat. Spring or fall would work, yes? I totally winged the whole thing actually, and it was OK! I think May is a very popular month as well (I just finished the trip, I’m current with my blog now 😉 but the locals all say that the fall is the best time of year. Wow this content is admirable. You already had me with the off-the-grid solar panel source, lol. Just giving up some of that freedom vibe as you relax and appreciate every destination’s hotspot. Thank you for sharing this! Now sooooo much more excited – we’re heading to Utah tomorrow! Great pics and thanks for these tips. This trip looks awesome Kristin. Thanks for sharing. 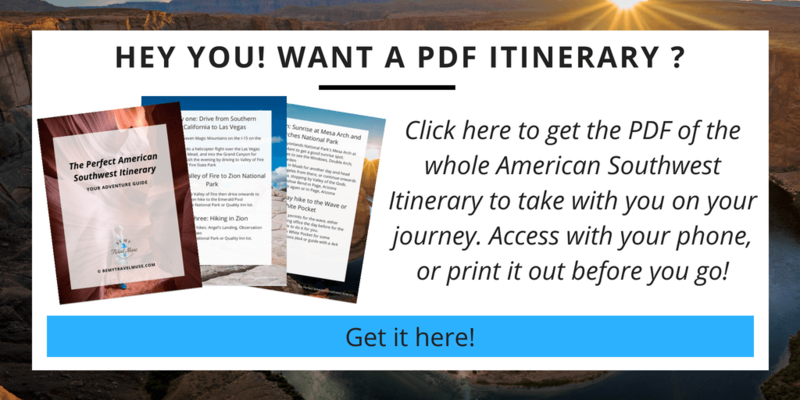 I have a SW itinerary on my list: Havasupai – Sedona – Antelope Canyon. You definitely saw and did a lot in one week! Those pics though?! Really amazing. I totally missed Havasupai and Sedona and it broke my heart! So many hard decisions to make there! I’m totally adding the American Southwest to my list. Just wondering, any idea/thoughts/knowledge on dog friendly or not? I’d love to bring my boys but not sure if it would be worth it for them. Rough numbers, what would you recommend for money to do a trip as you did? I think it depends on which parks you visit if you’d want to bring a dog along. A lot of the trails I did would not be appropriate for dogs either but you can probably find options! My main cost was gas since I free camped almost everywhere. I’ll do a budget post soon! Great post! It’s amazing how beautiful the American Southwest is. I grew up in Arizona and it’s embarrassing how little I’ve seen of it compared to what I’ve seen of the rest of the world! Given me some serious wanderlust for my own backyard! Next time you’re in the area, you should definitely check out Sedona. I lived there for a little bit and it is absolutely beautiful. The Tonto Natural Bridge in central AZ is also really worth visiting and I don’t think it gets enough credit compared to the everything else AZ has to offer. It broke my heart that I didn’t have time for Sedona. I drove right by it! Had to make some tough choices but I do want to go back. Hi Kristen – I’d like to learn more about this since my boyfriend and I are planning on following your itinerary in September. Jucy RV isn’t available out of Las Vegas during our dates, which we’re planning on doing and my boyfriend isn’t into the whole hiking & sweating everyday, & then not showering …so we might end up going with a suped up RV for $300ish/day which I’d prefer not to if we can shower at campsites. Can you let me know which campsites you stopped at and the amenities they have? He would like to shower daily but I’d be fine w every other day. Also, is it cool at night for sleeping? I’m assuming the campervan has AC but don’t want to leave it running all night. Also, would you recommend purchasing the unlimited miles option? In most campsites you can find hookups and be fine. I just didn’t use campsites and free camped instead. It’s cold at night usually! Yes I’d do unlimited miles for this particular itinerary. Thanks! We did unlimited miles with Escape campervans and we’re going to get one of those bag showers! My husband and I just decided this weekend to fly out to Utah in October and rent a camper van. I can’t wait and the more I read I just keep getting more excited. Is it easy to know when you’re on public lands to camp? This will be my first trip west so I don’t really know what to expect. You can look up maps before you go but yeah, it’s usually pretty clear, at least it was to me. Don’t be sad about missing Havasupai. A permit is required to go there. Permits for all of 2017 became available on Feb 1, 2017 and were gone in days. It isn’t a drive by destination. It’s a 10 mile hike in, an overnight and a 10 mile hike out. I wouldn’t mind the hike in, to the falls or the actual Grand Canyon! Try 70 in Utah as well. My husband drives a truck and we came in through Salt Lake and leaving went on 70 past 4 or 5 of the canyons. To say breathtaking is an understatement. I was in years from the beauty. Have never seen so much in one day. Simply amazing!!! I’ve been home almosy a month and still havent gone through my pictures. Great write-up and pictures. A map would be most helpful. I am a big fan. I am following the above itinerary, but landing in Las Vegas and starting from Zion. I plan on going the Christmas week. I see weather not too bad, but would you suggest it? Also, keep doing what you are doing, you are a great inspiration for people like me! If there is snow in Zion and the narrows are iced over that will be magical. Just be prepared for road conditions to potentially be icy. You can do shorter hikes in Zion than observation point, like the emerald pool, which is very nice. If you are RVing then you would probably skip Coyote Gulch as well, which were my two longest days. Dead Horse is one you drive up to, and if you do White Pocket with Mike that’s not much walking either, plus it’s so engaging and beautiful since the rock formations are all so unique and different, they won’t even notice how far they’ve gone! It’s getting stricter with time, but definitely not in the national parks, and for State Parks like Dead Horse, only at certain times of year. Hello, I love your post! I’m thinking of doing almost the same roadtrip as you very soon; however it was frustrating because my friend dropped out last minute. Did you feel lonely at all going solo on the road? I just want to get your thoughts bc I’m a little hesitant to just do this roadtrip with no company. I feel like it’s just a different dynamic than solo backpacking and staying at hostels, which I’ve done in the past and you always meet people. I actually LOVED it and still think of it as one of my best trips ever. I met people sometimes at the free BLM campsites, as well as just randomly on trails and once in a parking lot of a campsite where I was showering. I got to talking to that guy, invited him to watch the sunset at Horseshoe bend with me, then we even met up again when I was in Chiang Mai in January. I was surprised by how many people I met. I also spent a lot of time alone and I loved that too. Being alone in the desert is profound. Go for it! I’m so glad I found your post after typing “solo road trip USA” in Google. ? Just slightly worried for the 4+ to 5 hour drive each leg… (Friends say I’m crazy & told me to just join the tours to Antelope canyons & forgot abt the rest) but your post is very assuring! I wasn’t planning on getting an RV though, just a compact car & stay at the town motels etc. Thanks in advance for your sharing. I had a camper van which was convenient since it allowed me to stay out near the entrances to the parks but motels would be fine too! You’ll spend all morning getting from point A to B, that’s the main thing. I feel like you’d have so little time in each place it might be better to pick either Page or Moab and give yourself one full day without driving in one of them. I’d pick Moab, personally. I also had breaks here and there when I didn’t have a super long drive, and that made it enjoyable for me. However if you really want to see it all, then do it girl! Antelope Canyon and horseshoe bend aren’t really hikes, and you can see a lot in Arches without hiking either. We’re planning a similar trip this fall, so your post will come in really handy as we really start to plan. Thanks so much for the wonderful ideas! Which drone do you use for photography? Would you be able to tell me the model number? My family and I live in Cincinnati, Ohio. Which airport do you recommend to fly into that is close enough to one of these parks besides LAX? You could also do Salt Lake City or Las Vegas. My family is flying into Las Vegas for the first week of April. We are planning on driving to the Grand Canyon first for an overnight stay then onto Zion for a couple days before ending up in Park City. Do you have any suggestions for hikes and sight seeing for this short trip that would maximize the time? Oh wow this looks AMAZING. Bookmarking this post so I can use as reference for when the day finally comes and I visit all these places! Goblin Valley looks awesome!